It is common for a high mileage Ford Taurus or Mercury Sable to develop a coolant leak on the passenger side of the engine. At first you may notice coolant slowly disappearing, but the leak will eventually get to the point that you need to fix it. The cause of the problem is the gasket on the back passenger side of the engine gets cooked by the exhaust pipe (top of the Y pipe), and the heat soaked gasket breaks down. The repair should be similar for all listed, but we are going to focus on the problems and tips I had for a 2002 Mercury Sable. Metric sockets both deep and regular. – It will help to have a couple sets of extensions as well. – (13 MM is used extensively) * it is best to get the 6 sided type. You will be switching wrenches quite a bit if you do not have access to power tools there are a lot of tight spaces. Timing Chain and new gear? I’m not going to do mine because I don’t expect the car to live long enough for it to be a problem. You need to remove all the bolts/nuts from the heat shield. (Back Passenger side) You will need to pull it out and push it back out of the way. (Not all the way out) – be careful when you are putting the Y pipe back together the heat shield can push the pipe into a position that will cause cross threading. 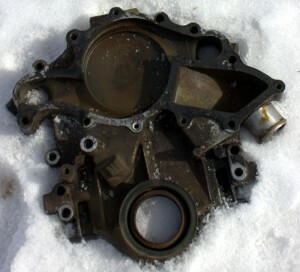 Make sure you REMOVE THE WATER PUMP FROM TIMING COVER! in the video he states that it comes you can leave the powersteering pump in and that the timing cover and water pump come out as a unit. DON’T DO THAT! It works if you have the power steering pump assembly pulled but you will not be able to get it out if you do not. If you are leaking coolant you are likely leaking oil as well. Here is a video on how to replace the oil pan gasket. I drained the oil and coolant out of the car a day early so I didn’t have much mess when I dropped the oil pan. It helps to have a 8mm gear wrench to the the shield off.